Romanian Air Force with Guardian system answers request from EU Civil Protection mechanism to assist fight against wildfires in Greece A Romanian Air Force C-27J Spartan aircraft, trained for aerial wildfire fighting, and a RoAF C-130 Hercules aircraft, for logistical support, together with approximately 20 military-crews and auxiliary personnel, engaged the active wildfires in Greece. 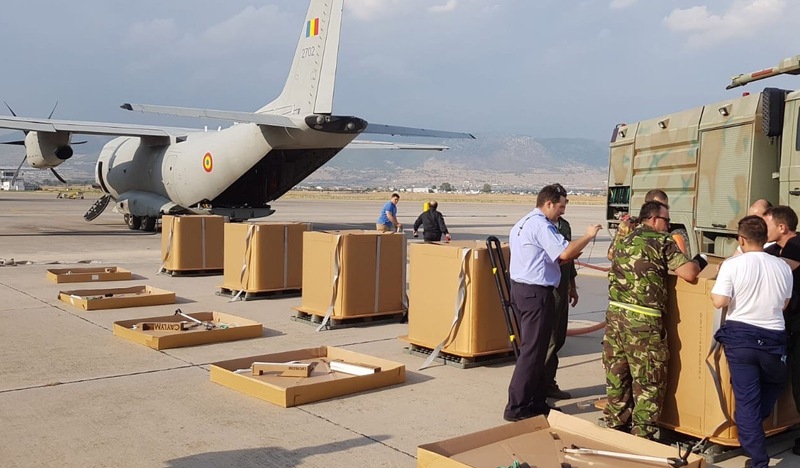 Aircraft are made available by the ministry of national defence under the European Union Civil Protection mechanism that coordinates the response to natural and man-made disasters at EU level, allowing coordinated, effective and rapid assistance to support the affected populations. Caylym’s Guardian system enables hundreds more available aircraft to join the fight against wildfires, from the air, twentyfour hours a day. And, using well established cargo delivery procedures, allows formations of aircraft to attack wildfires safely, from higher altitudes, at lower cost. Learn more about the Guardian. Click here. There are over 210,000 wildfires each year, worldwide; and more than 70,000* in the United States alone. Governments are under tremendous fiscal constraints and are unable to purchase & maintain specially configured, single mission aircraft to meet the demand required to suppress wildfires. Higher altitude drops would enable full 24 hour fire suppression and allow for round the clock suppression. "The fire no longer owns the night"
Caylym has a patented system that answers this global problem with a low cost, simple, safe and effective solution: The Guardian. "The Guardian... a 4-foot cardboard cube... designed to fit in the back of any airplane or helicopter... acts as a metric ton rain drop to help fight fires more efficiently and safely..."
"A company dedicated to fighting wildfires with cargo planes and cardboard boxes full of water has expanded..."
News Story - Sen. McCain pushes for Alenia C-27J's to aid in US firefighting efforts. News Story - Sen. Udall presses DoD to transfer unneeded C-27J's to U.S. Forest Service to aid fire surpression.